Have you ever had that feeling of happiness and sadness at the same time? Like, when you finish reading a fantastic book, or when the lights come on after a standing ovation at the theater – it’s a feeling of complete joy but also sadness about that enjoyable experience coming to a close. This may sound over-romanticized, but that’s how I always feel after Thanksgiving weekend is over, and this year was no exception. My Turkey Day Trials paid off as the menu was flawless and well-prepared. The snow day our district received the Wednesday prior was also an added bonus as I was able to get many dishes done ahead of time. By the time the sun came up on Thursday, drying out all the snow and thawing out the ground, Rob and I were able to enjoy breakfast, watch the Macy’s Parade, watch the Dog Show, and cheer on the Patriots in the background while trussing the turkey. The only time our schedule got tight was when I forgot to broil the yams (to toast the ever-present, much debated marshmallow topping). As my parents knocked on the door, we had cocktails and hors d’oeuvres ready, with dinner fresh and hot on the warming tray. It was so good to see my mom and dad again, and even better to have them stay as guests in our home. It felt like our little house was now completely nested having such great company. – Turkey (not stuffed, but filled with garlic, lemon, sage, rosemary, and thyme, and drenched in olive oil, salt and pepper. I also poured a mix of white wine and turkey stock into the bottom of the roaster, so a flavorful steam would keep the bird moist). – Marshmallow yams (an old classic made super flavorful by roasting yams – skin on – adding real maple syrup to the mix, and toasting the you-know-what out of the marshmallows). – Dinner rolls (Alex Guarnaschelli’s recipe) with homemade sage honey butter. – Pumpkin pie (since my disastrous pumpkin pie episode, I’ve made 4… let’s just say I got the recipe down). 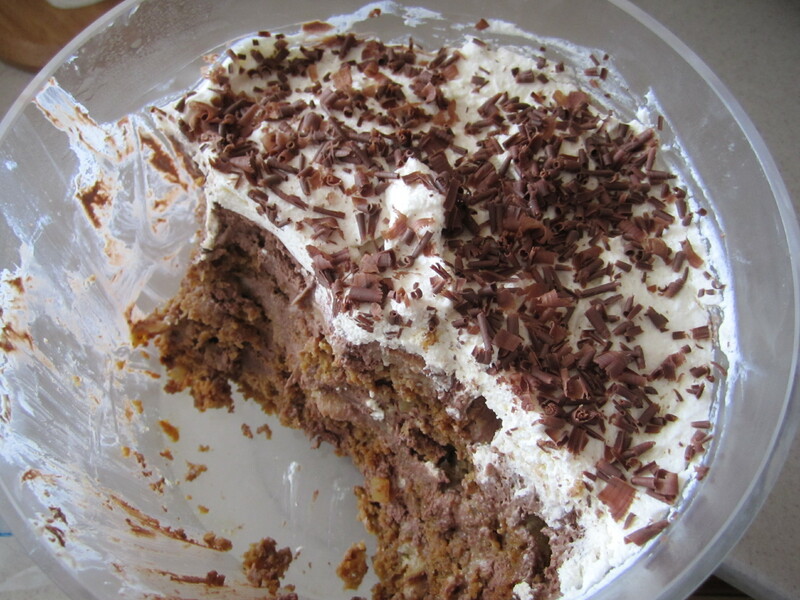 – Gingerbread, chocolate mousse, & brandied pear trifle (OMG. Really, just OMG). Seriously, I think we all gained about 7 1/2 pounds each. But this smorgasbord provided excellent leftover options, which is, arguably, the best part of Thanksgiving dinner. The desserts made excellent accompaniments to the morning cups of joe, and the delicious buttery dinner rolls were perfect vehicles for shoveling overflowing turkey and cranberry sandwiches (with extra mayo) into our wide-open mouths. We stayed pretty active the whole weekend seeing the sites Coos Bay had to offer. One major highlight was the HH-65 circling our house with a fully dressed Santa Claus jubilantly waving out the side door (it’s good to have connections to people who can fly Santa around!). We hiked, we explored, we shopped, we got rained on, and were always welcomed back to an exuberant amount of leftovers and a warm fireplace. And when the weather got too dodgy, the games we played (or maybe how we played them) were so side-splitting funny, Seinfeld could have used us for a new pilot sitcom. Scrabble Slam was the first requested game, which led to a flurry of thrown cards, and frenzied shouting of suitable-for-the-family 4-letter-words. I, at one point, tried my hardest to get “poop” down on the table, but to no avail just kept shouting the word “poop” while someone else’s card took my spot. Yeah, how’s that mental image treating you? And then there was Slamwich. Slamwich is the best game – ever. I highly recommend this game to any foodie fan, or just anyone in general looking for an entertaining way to make, munch, and steal a sandwich. My mom and I purchased the game in Florence after a day of shopping, and met my dad and Rob at the sports bar they were holding down watching the Oregon game. Joining them, we sat at the bar, ordered a drink and appetizers, and proceeded to read the rules to this silly, silly game. 15 minutes later, we were drawing serious looks from across the room as we were slapping slices of bacon, cheering on our sandwich thieves, and calling out each other’s “slipslaps” with gusto. Needless to say, we were quite a scene. As most wonderful things do, the weekend flew by. 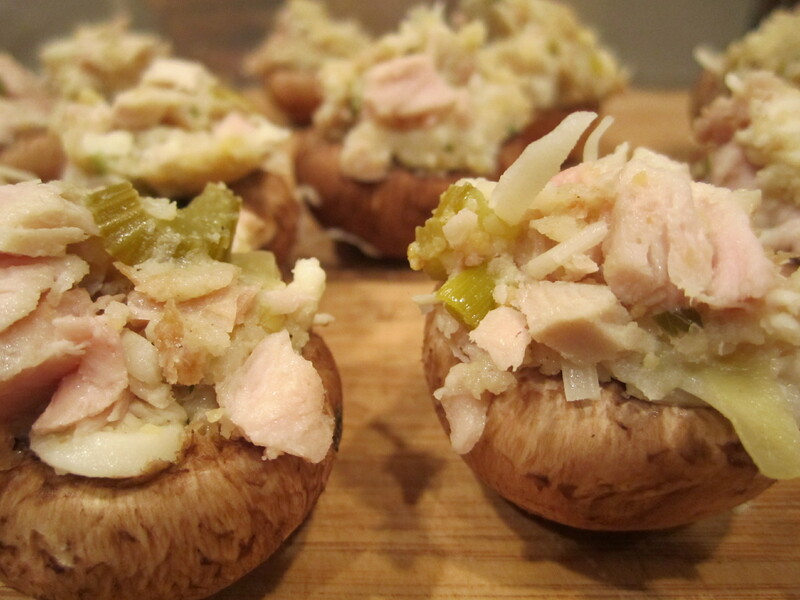 Rob and I finished most of the leftovers with stuffing and turkey stuffed mushrooms and relaxed before getting ready to face another Monday workday. Although this Monday our pants were quite a bit tighter, it was just a reminder of the fabulous family, food, fun, and fabulous Thanksgiving weekend memories. Two more days until the greatest day of the year! Yesterday was one of those days that starts off right, and just keeps getting better. I had a meeting in the morning and had prepared the previous Friday for my substitute. So I had no worries about completing last minute sub plans. It has been very, very cold lately, and on my Eugene trip I bought a beautiful pair of black leather boots that I was just dying to wear (Rob says they look like I’m about to go ride a horse. If that’s true, then Hi-Ho Silver! They kept me warm and dry). The meeting was actually beneficial, entertaining, and gave me a renewed outlook on our educational system. This turned out to be a 24-hour renewal as it was completely squashed again by this morning’s meeting, but that’s another story for another time. Anywho, I came back to school, my kids were cute, my lesson on the meaning of the equals sign went well, and the bell exuberantly rang with the joyous sound of the work-day coming to a close. While finishing up some paperwork, my computer bings, and I look up to see a string of emails from the district explaining what to do and who to contact in case the next day was a snow day. I was so excited. Having lived in snowy climates before, I was instantly reminded of the fluffy, cold, white goodness. But remember, people, the last 16 years I spent in a combination of SoCal sun and Arizona desert – my excitement had validity. Knowing the snow and cold weather could possibly create icy roads, I quickly cleaned up my classroom, and left to run my final errands to get the remaining items needed for Thanksgiving. Then I came home, put on the heat, started the fire (which is really only a flick of a switch), lit some candles and got to work on my do-ahead dishes. Sounds quite romantic for cooking, eh? My first do-ahead dish was applesauce. I love, love, love homemade applesauce, but I’m also a bit picky about it. To keep the integrity of the apples, I don’t add any sweetness at all. The natural sugars from the apples are extracted slowly by the low heat and the salt. I only use Granny Smith apples because I believe they are the best baking apple having the perfect balance of sweetness and tang. Rob got a kick out of using my apple-peeler-slicer-corer tool (something that seemed like a ridiculous price to pay for a tool I use very sparingly, but when it comes to peeling and coring a dozen apples a couple of times every holiday season, I’m really glad I have it). 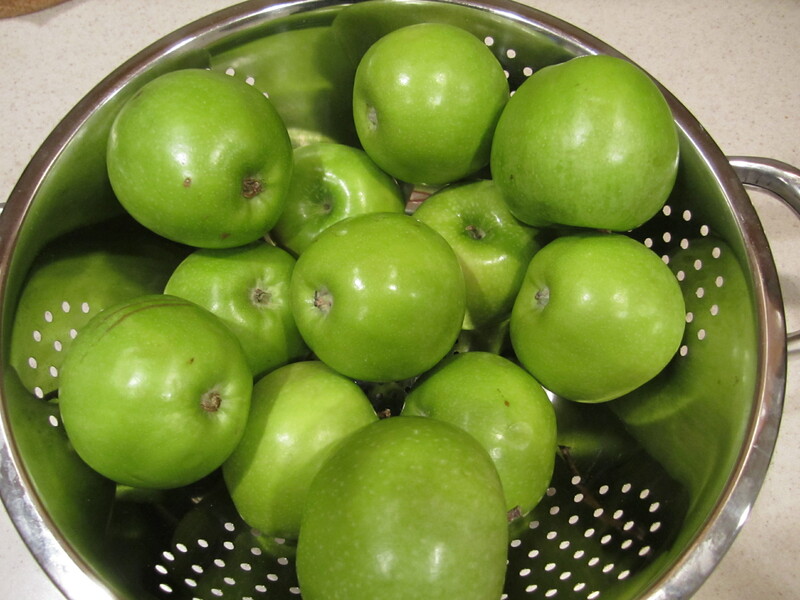 After a slow stew of deliciously mouth-watering smelling apples, our applesauce was ready to go for the big day. Then, it was onward to the gingerbread. I am planning on doing a gingerbread trifle with chocolate mouse and brandied pears (I nixed the original plan for the cranberries), and I needed to test out my gingerbread recipe. Now, I must clarify, yes, this is a desert. But I am still making the pumpkin pie (I did try again – with completely defrosted dough – and got an excellent result). What is so interesting about gingerbread is it’s main taste isn’t ginger at all – it is molasses. I’m not a huge fan of molasses by itself, but mixed and baked with tangerine zest, honey, thick yogurt, and ground ginger, it turns into such a special, spicy treat. I even chopped up some crystalized ginger (thanks for that idea, Ina! ), and it added an extra warmth and chew to the rich bread. Oh so yummy. So with the deserts under control, I went to bed thinking I was going to get a 5:00am phone call from our school district telling me to go back to sleep for the better part of the day. The wind and sleet woke me up numerous times throughout the night, but the thought that I would be able to take a nap during the day eased my weather-induced insomnia. When my alarm woke me up – at 5:30 – the reality sunk in: we were not having a snow day today. Maybe it was due to the lack of sleep, maybe it was the fact that I haven’t been in a snowy environment in ages, or maybe it was the fact that I realized I needed to drive in this weather in which I’m not familiar, but the whole morning seemed surreal. I got to school safely after a little white-knuckle driving, survived the question-marks-over-the-head morning meeting, turned on my space heater and computer (in that order), and just sat back. My out loud internal monologue kicked in: What am I doing? Why am I not enjoying this? So, with my new warm boots, a hood over my head, tea in one hand and freshly baked gingerbread in the other, I joined the joyous screaming kids dancing and twirling around in the falling crystals. It was fantastic. Heat all ingredients in a dutch oven on high heat until water starts to bubble. Turn down to low, stir occasionally, and let simmer until apples become saucy, about 20 minutes. Let cool, and serve with a bit of good quality honey, or cinnamon. Mix all dry ingredients (minus zest and crystallized ginger) in a bowl. Using a stand mixer, mix the yogurt, molasses and honey together just to incorporate. Add eggs one at a time, and mix to incorporate. Mixing in thirds, add the dry ingredients. Add zest and ginger, and fold into the batter. Pour batter into prepared baking dish (buttered and dusted with flour) and bake until gingerbread has risen and a toothpick inserted comes out clean, about 30-40 minutes. The countdown is in full swing – 5 days until the big day! The biggest foodie day of the year! The day of golden, crispy, poultry-driven naps!! And – my favorite thing to eat at this time of year – pumpkin pie! For the last couple of weeks I have been thinking about what traditional dishes, new dishes, and most of all, immensely flavorful dishes I can make for Thanksgiving. I have already tried the turkey, tonight I perfected a dressing (stuffing without being stuffed – but I’ll refer to it as stuffing from here on out), and I already have plans for a brandied pear mouse trifle with gingerbread and cranberries. The last thing I thought I would need to really perfect is the pumpkin pie – it is so easy! Just follow the directions on the side of the can: pumpkin, spices, eggs, and evaporated milk. Use the shortcut of frozen pre-made pie crust, and the star dessert is done without a fuss. So I thought. What happened to my pumpkin pie parallels what happened today while I was driving north on the 101. We have had on and off rain and thunderstorms, but one of the coolest things about the southern Oregon coast is how quickly the weather changes. It will be sunny one minute, and a huge gust of arctic wind will bring in a thunderhead and your bones will be soaked by sleet in a matter of minutes. Well, as I was driving and passing Coos Bay (the actually bay) and looking up, to the right of me was sunlight and blue sky. To the left were dark, ominous clouds. And the road in which I was driving on was being drizzled by rain from, what seemed like, an invisible cloud. Since physics and natural wonders work in an odd relationship to create beautiful things (kinda like Michael Douglas and Catherine Zeta-Jones), a giant rainbow formed. I, like most people, have seen my share of rainbows, and the reaction is always the same: “Oh! Look! A rainbow! Ahhh, cool! So, about that Obamacare…” But this rainbow literally made my jaw drop. First of all, it was a perfect half-circle, so bright it almost looked fake, and I could see the “end” of the rainbow (there was unfortunately no gold. Nor any little green men running around. Only cold bay water with some Chinook salmon). Despite the fact that I was driving, I watched this rainbow, and it was continually changing. The light would refract in different ways, making it lighter, dimmer, and even seem to move a bit. I had a bit of time (relatively) to watch this rainbow dance around in it’s nature, but as quickly as it appeared, it was gone. Being that I was driving through town, I looked at the road and looked up again only to see a rainbow fading. Then, once again it came back. I blinked, and it was gone. I looked up from driving and it was back again. Once I even caught it flickering like a French Quarter gas lamp. Eventually, those thunderous clouds covered up the sun, blocking the light, dropping more rain, and making the fleeting moment of colorful beauty go back to just being a humble bay. At that point, I got thoughtful and started thinking about the science behind how that rainbow appeared, flickered, and reappeared only to disappear for good. Then, with Christmas music aptly playing in the background, I started to think about the sentimentality behind watching a rainbow disappear. Wasn’t that sad? It was so beautiful, and now it’s gone. But, to be honest, it didn’t make me sad. It just made me thank nature, fate, and science for being at the right place at the right time. This is the season for thanks, right? So, after my traveling today (another trip to Eugene), I came home to make pumpkin pie, stuffing, and Cardamom Shortbread Cookies. Rob, being on duty, was awaiting a yummy dinner, so I made the stuffing extra hearty with chicken sausage to complete the meal in one dish. The stuffing was a hit. 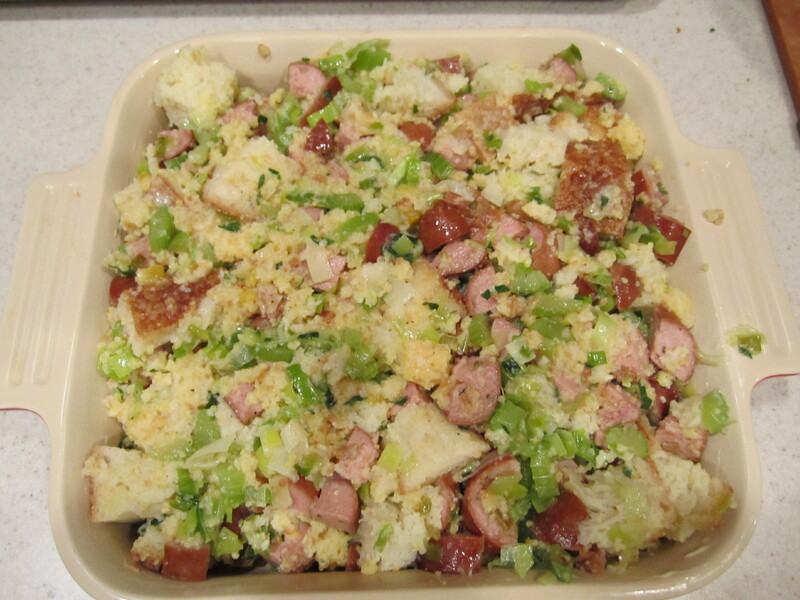 The combination of sourdough bread and cornbread added texture, sourness and sweetness, and the sauteing of leeks and celery perfumed the whole house. I added some apple and white wine chicken sausage, some fresh herbs, and it was completely second serving-worthy. The pumpkin pie, however, was a different story. I followed the recipe exactly! Being a true purist when it comes to pumpkin pie, I did not do anything fancy, nor put my own twist on the classic – I simply read the can! And like the rainbow, it started out beautifully. Within the first 15 minutes, the kitchen started to smell of cinnamon and ground cloves, and after a few peeks in the oven, I started seeing the top of the pie start to solidify and form. But then, also like the rainbow, it started having fleeting moments – one second I thought it was done, but then I realized the middle was still liquidy. When the top was done, the bottom wasn’t. And just when I thought I had cooked it long enough and had made the perfect pumpkin pie, I pulled it out of the oven only to be met with a mixed emotion – it smelled right, it looked right (except for a couple of overdone brown spots), but it’s beauty disappeared within the first cut. The pie hadn’t set at all. It was runny, the texture was off – almost grainy, of all things – and just plain not right. It still tasted like pumpkin pie, but the texture was obviously not what it should have been. 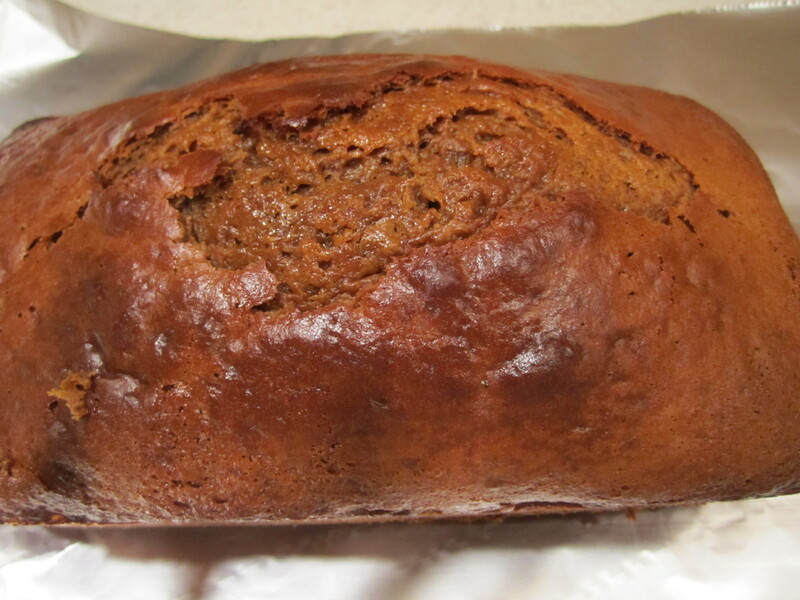 I started to feel defeated, then, blamed nature (baking is never easy in a moist environment! ), but then realized that was ridiculous. After that, I blamed science – the chemistry of baking is a delicate and finicky art! But that wasn’t the reason either. My shortcut of using a pre-made pie crust had turned into a unpaved road of disaster since I hadn’t defrosted it all the way. The heat from the oven created steam from the bottom of the crust, which rose into the pie, and did not escape. I wonder, did Tyler Florence ever make such a silly mistake? Nevertheless, I still had one more desert to redeem myself – my Cardamom Shortbread Cookies. Being a crunchy cookie fan, I have a higher butter to flour ratio than other shortbread recipes, and slightly – purposefully – overbake them. They do not taste like overcooked cookies, but rather nutty, with the warm spiciness from the cardamom breaking through the sugary shortbread sweetness. 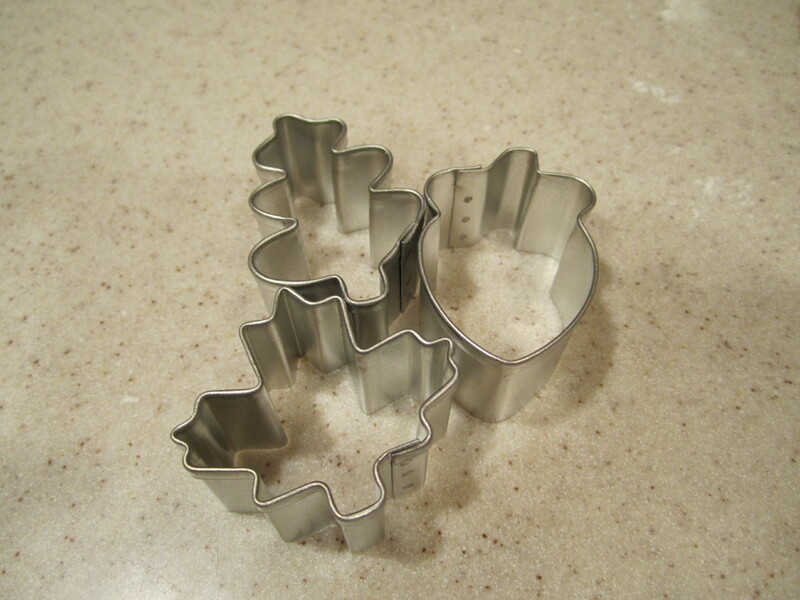 And the cute leaf cookie cutters also seem to add a fall flare to boot. Try and enjoy the stuffing, and definitely have fun with the cookies. And learn from my mistake on the simplest recipe I had tonight – nature and science matter. Completely defrost your dough. Heat olive oil over med-high heat in a large saute pan. 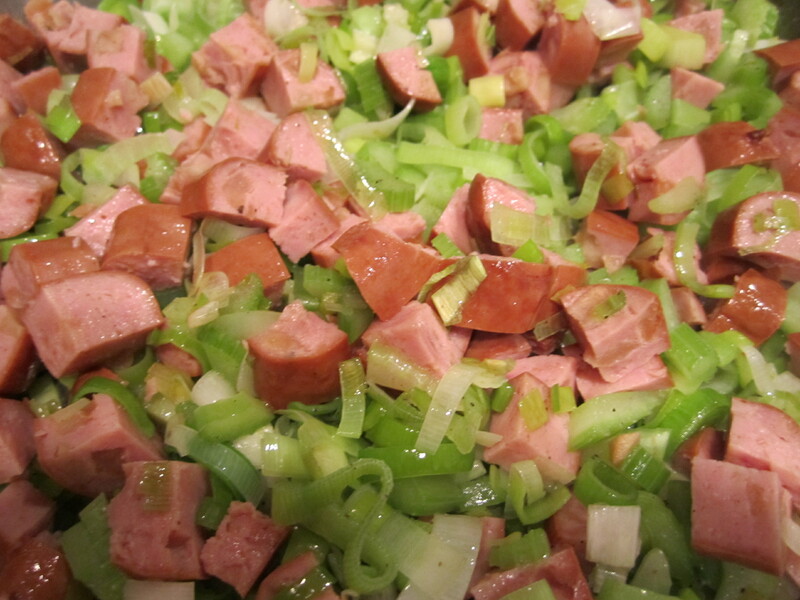 Add leeks and celery, s&p, and saute until soft, but still has an bite (you want to keep the integrity of the veg). Add the sausage, and heat until warmed through. Add herbs, and taste for seasoning. Turn off heat. In a large bowl, combine the 2 breads, the beaten egg, chicken stock, and the veg and saute saute. Mix very well to combine, and let the bread soak up the added liquid. Pour mixture into the prepared baking dish. Bake for 30 minutes until top is slightly browned and middle is soft but combined. Serve on top of greens, squash soup, with your favorite prepared turkey, or by itself! Preheat oven to 350 degrees. Line a baking sheet with parchment paper, or a silicone baking mat. Cream the butter and sugar together in a stand mixer. Meanwhile, combine flour, sugar, and cardamom. Add vanilla extract to the butter sugar mixture, and then add the dry ingredients 1/3 at a time. When dough comes together, turn out onto a lightly floured surface and shape into a disk. Refrigerate for 30 minutes (if you wanted to freeze the dough, now is the time to do so). 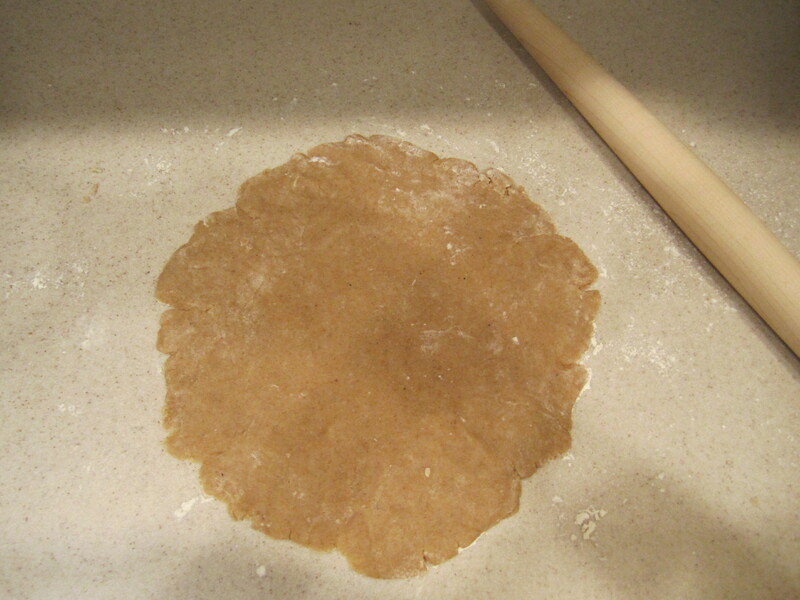 Roll out the dough on a lightly floured surface until the disk is 1/8 inch in thickness. 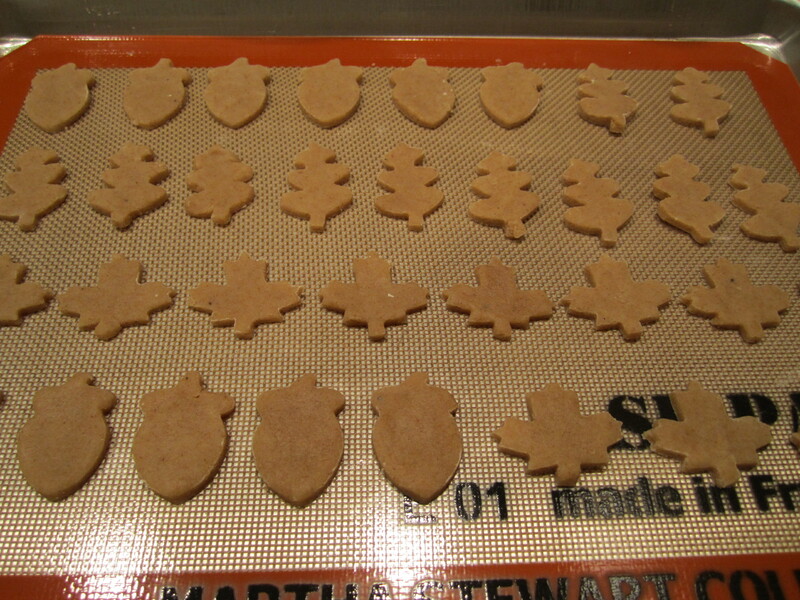 Using whatever cutter you prefer, cut out cookies. Re-form and re-roll dough to make more cookies out of the initial scraps. Bake for 20-25 minutes until browned on top and crispy on the bottom. Let cool.